In less than two months’ Patricia Burchall’s Bernews site has proved a welcome and successful addition to the local media landscape. The site has just picked up a TechWeek Award for best local website and impressively has already passed the 1 million page view mark [Pause for disclosure: one of my clients is a prominent advertiser]. With its focus on breaking news and clean web 2.0 design, Bernews is suceeding where Walton Brown’s defunct Bermuda News Network – the first real attempt at a daily news site – failed two years ago. “provide news “as it happens” to the public as a whole who are interested in the happenings in Bermuda. We provide an objective, unbiased approach through the medium of internet. Our news is reported on a purely factual basis, with no editorial in news stories. At present, the website remains blank – although this morning it is bizarrely ranked No.2 in Google search results for “Bermuda news”. What’s also interesting about the new BNN is that it’s being promoted by Rock Media, which amongst other things run advertising at the airport, the ad boxes at bus stops and ferries, and publishes the tourist magazine It’s A Bermudaful Day. Rock Media is run by American Jim Kerwin who seems to have a close relationship with Government and the Premier in particular. Walton Brown, of course, is a relative of Dr Brown, a Government Senator and was rumoured to be the editor the Premier’s planned new daily newspaper. That was expected to have been launched this year but given the current economic climate it may have been put on hold and resources are instead being pumped into BNN. One of the reasons the first BNN failed was that in many ways it was ahead of its time and that advertisers simply weren’t prepared to pay realistic rates for web advertising. 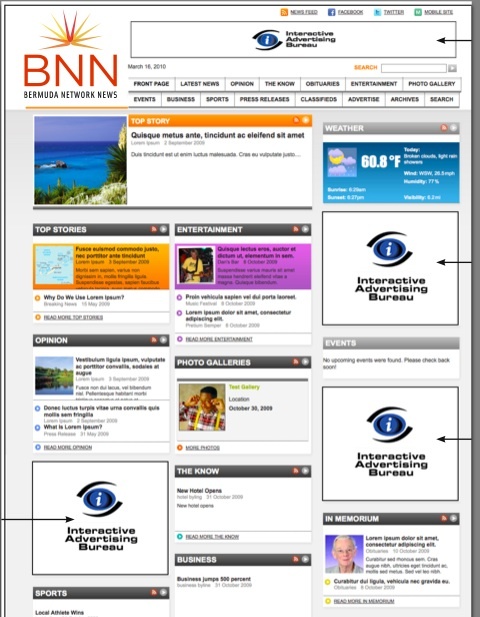 [See my Bermudian Business article on new media. Pause for second disclosure: two clients of mine were advertisers on BNN.] Consequently the venture folded with former editor Christen Pears suing Mr Brown. With the explosion of social media and the advent of the iPad, iPhone and similar smart portable wireless devices, that market may now have turned a corner. If that’s the case, Bernews – and the rest of Bermuda’s news media – are likely to face some stiff competition, especially if BNN puts resources into proper editorial staffing. Any addition to the media landscape is to be welcomed but with more outlets chasing portions of a seemingly shrinking advertising pie, it remains to be seen whether any of them can sustain a profitable business. It also remains to be seen, given the political connections, whether BNN can live up to its promised of balanced reporting. These are indeed interesting times and as they used to say in the news business – watch this space!